The ordering process at Walmart.com is really quick and easy! I was going to make a quick video for you, but due to technical difficulties I am going to explain it and use screen shots. 3. Click on "Go to Cart and Check Out"
5. Click "Proceed to Checkout"
6. Sign in, Continue as Guest or Create a New Account. I decided to continue as a guest for this purpose. 8. Choose and enter your payment method. You can pay with a credit card, debit card, gift card, paypal, there is a bill me later option and you can even pay with cash! I blocked out my address information for security. After those 9 quick and easy steps, your package will be on it's way to you. It took me way longer to do the screen shots then it took to actually do the ordering process. If you type fast like I do, you can do it in about a minute. I'm really excited to try out this Herbal Essences Naked Volume Kit! I have always loved Herbal Essences and this collection has no dyes! Watch for my review in the next few weeks. One lucky reader will win a $50 Walmart Gift Card to purchase the Naked Volume Kit for themselves! **TO ENTER- Enter using the Rafflecopter below. Note: It may take a moment for the Rafflecopter to load. If you are reading this via RSS or Email, please visit the website to enter** Giveaway is open to US Residents only. Ends 1/08 at 11:59pm. *Disclaimer: The Walmart gift card and information have been provided by Herbal Essences. I will probably the new Herbal Essences Naked Volume collection. I think it's amazing. I would try anything that will help give my hair more body and volume. I would love to try it my hair is in need of some volume. i would really love to try it. my hair is so dull and lifeless. I sure could use some volume to my hair. I will try this! I have very fine hair and would love to try the volumizing. I think that being free of many of the chemicals may make this less likely to weigh down my hair. I'd love to try it, especially the dry shampoo! I'm always looking for a good volumizing shampoo so this looks perfect for me!! I would totally try this! It sounds really good and just like what I need for my hair. Tell me your thoughts about the new Herbal Essences Naked Volume collection. Will you try it? I will definitely try it! I love that it is free of dyes and chemicals. Thank you for the nice giveaway! Absolutely I will try it. I've always liked the brand and products. Yes I will be trying this collection. My hair is fine and needs a lift. I will try it.It looks pretty good. Yes, I would love to try Herbal Essences Naked Volume Kit. I've never used dry shampoo before. I have not yet tried these particular products. I would love to. Herbal Essences have the BEST scents! That alone makes me happy! I would have to see if they would be conditioning enough for my course hair. I need "super" moisturizing stuff or my hair looks like a crazed thing. I would love to try the Naked Volume Collection by Herbal Essences. I def want to try it! I love herbal essences, so I will def try this! It sounds like a product I could use. I'll try it. sounds amazing, would love to try. Oh yes, I will absolutely love to try it !! I wouldn't try it, because I don't like the smell of mint; and I need something that works very well with dry frizzy hair. I will definitely have to try it. I love that it is paraben free. yes, i probably would! looks cool! It sounds great and yes I will deffinately try it. of course I would try it... at least once. can't be scared of a little shampoo and conditioner, I'm far too old to cry about them anymore! I will try it, Looks like it might help. I would love to try these products. My hair is especially flat in the winter, so I need all the volume I can get! It sounds great - I'd love to try it - I hope it will jazz up the winter hair doldrums! I would love to try the Dry shampoo, Thank you! I will try it. Have always loved the results and the nice smell of Herbal Essence products. I would definitely try this product. I have fine hair and can use all the volumizing I can get. It sounds awesome! I especially want to try the dry shampoo. I would love to try it. It sounds fabulous. I will try the condition and the dry shampoo. I love the brand and I want to try the dry shampoo. I’m looking forward to trying the Herbal Essences Naked Dry Shampoo . Yeah, I'd like to try the dry shampoo. Looks really cool! I would love to try the Dry Shampoo. i like the idea of products that create volume and i will try these products. my hair is very flat especially in the colder months. im looking forward to trying the dry shampoo. I've used Herbal Essences body wash AND shampoos, so I would love to try these products. Thanks for the giveaway. I will probably try this product. I do love me some herbal essence! I would love to try the dry shampoo! I love herbal essences. I love that they have a Dry Shampoo too for those extremely buy crazy days I have. I definitely will try these products!!! I will try it. I have always loved the results and the nice smell of Herbal Essence products. This is a product I would normally buy my fiancée but I think I would try this as well. I like the ingredients in this new line. I will try it, especially the dry shampoo. I will try it b/c it says it does not leave residue. I've been having a problem with that lately. I am always willing to try new products and since I already use their products I would be even more likely. 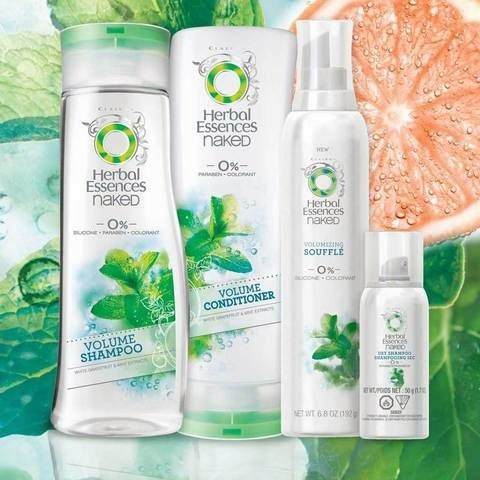 I love Herbal Essences and would love to try this new line! I can't use regular conditioner because my hair is so fine, I'd like to try this and see if it doesn't leave my hair lank and greasy looking. I like other Herbal Essences products and I am looking for good products to give my hair some volume. Yes I will try these products. I would love to try it. I love Herbal Essences products. Coming from someone with very fine hair the volumizing sounds great, I might have to try this. Yes I want to try the collection especially the dry shampoo. Can't wait to check it out next time I'm in Walgreens or CVS! lightlovebeing@gmail.com I am thinking about trying it. I have fine straight hair that tends to be oily and this sounds perfect for my hair type! I only use conditioner on my hair so I probably won't use it. But, I think it would be GREAT for my oldest son's hair. He has a VERY oily scalp & hair. He still showers at night, so the dry shampoo would be great for him in the morning before school. i can't wait to try the new shampoo! I would love to try this! Especially the dry shampoo. I would love to try this, it sounds like it would work well for my hair. I will try it, I love that it won't weigh your hair down. This new collection sounds great. I'd live to try it. I'd love to try it on my fine hair to give it some volume, great price for all the products too! I love that they contain no dyes & I would love to try them. I'd love to try this collection, especially the Volumizing Souffle. The combination of grapefruit and mint also sounds awesome! Already do and love it!! I would definitely try it, my hair needs the help, lol. I would give it a try, I hear that is works very well! Yes, I would love to add volume to my hair. I already love Herbal Essences.I will will try this one too! It sounds great. My wife would like to try it. She likes that it is made with natural ingredients. I'd love to try the new Herbal Essences products. Especially the dry shampoo! The Essences Naked Volume collection sounds great! I would love to try it. I already like Herbal Essences, so I will definitely try this line of products. I would love to try this out..Especially the souffle for my flat hair. I really wanna try this for my stale flat hair. I would love try it, seems like it would be very lightweight feeling which is good. I like the brand. My hair is flat, so I will look into trying some ! love to try the new Herbal Essences Naked Volume collection.